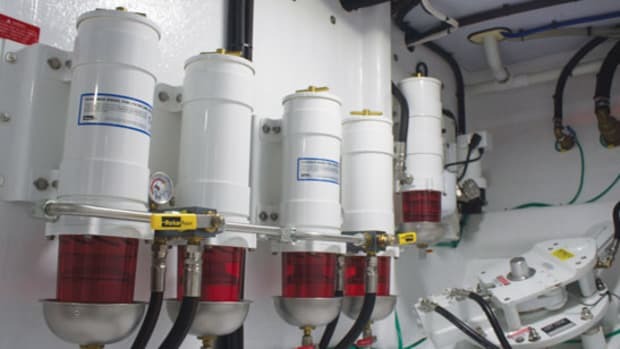 Technical expert Nigel Calder divulges six ways to improve your boat’s electrical efficiency. The moment the shore-power cord is unplugged and a boat moves away from the dock, almost all energy on board is created by running one or more fossil-fueled engines. House energy comes primarily from alternators attached to the propulsion engine(s) and from AC generators. In both cases, energy production as it currently exists is extraordinarily inefficient, and frequently results in long hours of relatively unproductive engine run time, with the associated maintenance, noise, exhaust fumes, and inconvenience. Evolving technologies are making much of this engine runtime unnecessary. Let’s look at this first in the context of alternators attached to the main engine(s) and operating either while underway or battery charging at anchor. 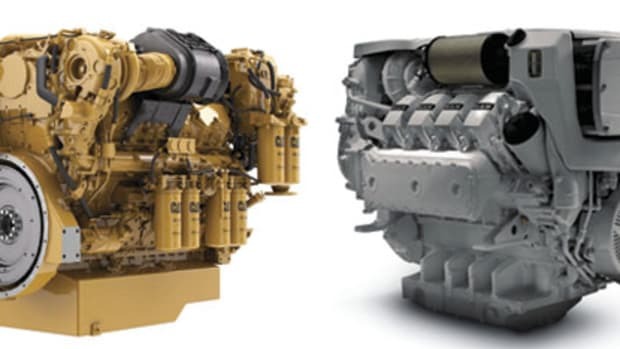 Almost all modern diesel engines have similar efficiency profiles, with peak efficiency for any given engine speed occurring at somewhere around 70 to 80 percent of the maximum power the engine can develop at this speed. If we attach a propeller to the engine, and size the propeller such that it absorbs the engine’s full power at full speed (this is the conventional mechanism for sizing a propeller), we find that at anything other than full speed (for example, at the normal cruising speed) the power absorbed by the propeller is substantially less than what is needed to operate the engine at peak efficiency. 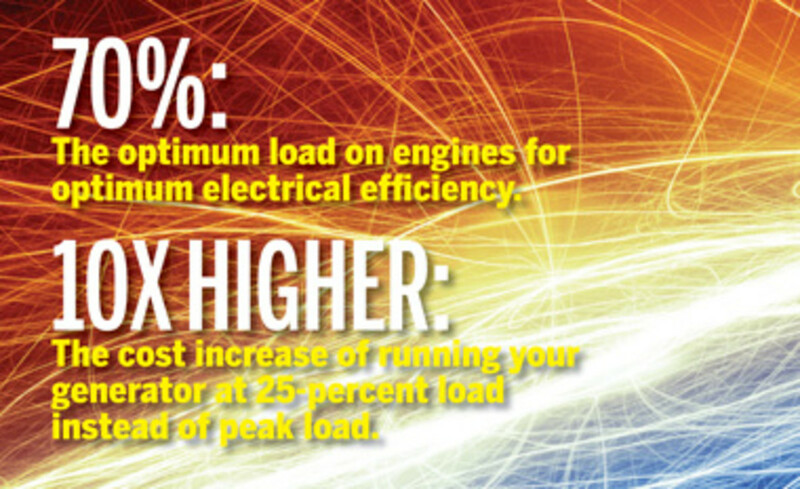 Although it sounds counterintuitive, anything we can do to add load to the engine will improve its efficiency. The immediate takeaway here is the more powerful the alternators we can fit to the engine, the more efficiently we will create electrical energy and also at the same time propel the boat—we gain on both sides of the equation, so to speak. The limiting factor in this scenario is our ability to use the electrical energy being generated by the alternators. It may be possible to apply much of it to the boat’s ongoing DC loads, and/or channel it to AC loads via DC-to-AC inverters. Any excess energy the alternators are capable of pumping out will need to be absorbed by batteries. Once the batteries approach a full state of charge, and their charge-acceptance rate declines, alternator output will have to be ramped down and we will be back to the conventional situation. As such, the key to pushing the alternator side of things is generally a large-enough battery bank, with a high-enough charge-acceptance rate to high-enough states of charge, to fully exploit the alternator output (for more on this, see below). 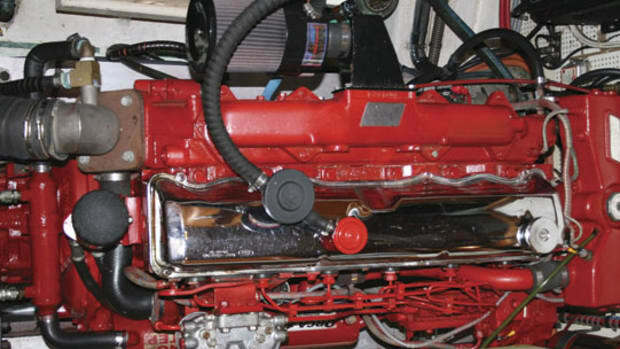 If a boat anchors and continues to use its main engine(s) for battery charging while no longer underway, the mismatch between the power the engine is capable of developing and that absorbed by even the largest alternators is so great as to make the engine appallingly inefficient. If you factor in the real cost of running the engine in this fashion (the largest cost component of which is not the fuel bill but the amortization cost of the engine) you discover the energy you are generating is also appallingly expensive (it is not unusual for this cost to be over $10 a kilowatt-hour, as opposed to the 10 to 20 cents you most likely pay your utility company at home). Fundamentally, main engines shouldn’t be used for battery charging at anchor. What happens if we supply our house power from an onboard AC generator? Let’s consider a generator powering a 16,000-Btu air conditioner (about what you’d need for a medium-sized saloon). The running load of the air conditioner will be around 1.5 kilowatts. In the past, electric-motor-driven devices, such as air conditioners, had high ‘start-up’ or ‘inrush’ loads, typically four to six times the running load—i.e. around 6 kilowatts in this case (this no longer applies to many newer devices as we will see below). It has been standard practice to specify at minimum a 6-kilowatt generator to power a 16,000-Btu air conditioner. But as soon as the air conditioner gets up to speed the running load on the generator is down to 25 percent of the generator’s rated output, and then when the cabin cools down and the air conditioner periodically cycles to ‘off’ there is no load at all. At 25-percent load almost all generators are operating at far below peak efficiency while at no load the system is infinitely inefficient. We are oscillating between being marginally efficient and appallingly inefficient! The overall effect is fuel consumption that is three to 10 times higher than would be the case if the generator always operated at peak efficiency. One way or another, this has been, and continues to be, a common operating profile for AC generators. The corollary to this inefficient mode of operation is the average load on the generator is a fraction of the generator’s rated load, which means the generator must be run long hours to deliver a given amount of energy. If the average load can be increased, not only does the fuel efficiency dramatically improve, but the number of hours the engine must be run to deliver a given amount of energy is also reduced directly in proportion to the increase in average load. This has obvious lifestyle benefits, substantially reduces maintenance requirements, and greatly reduces the cost of the energy being produced on board. The key to improved efficiency and reduced engine run-hours is to find mechanisms to maintain the load on engines at around 70 percent of their rated power at whatever speed they are being operated, and to shut down the engines and supply house power from nonengine sources any time this load cannot be sustained. There are a number of available and emerging mechanisms that make this possible. If we look first at alternators, we discover conventional alternators are typically no more than 50 percent efficient. It takes a humongous, heavy alternator to achieve high levels of output. Because alternator efficiency is so low, the real load on the engine is likely to be at least double the effective output from the alternator (the rest of the energy is dissipated as heat), often pushing at the limits of the acceptable load rating of the pulleys driving the alternator. The solution to these problems lies with modern brushless, permanent magnet technology which results in alternators with a far higher power density (i.e. much higher levels of output for a given size and weight) combined with efficiencies double that of conventional alternators. For the same belt and pulley load you get twice the output. Over the next year or two we will see an increasing number of impressive offerings of this kind. 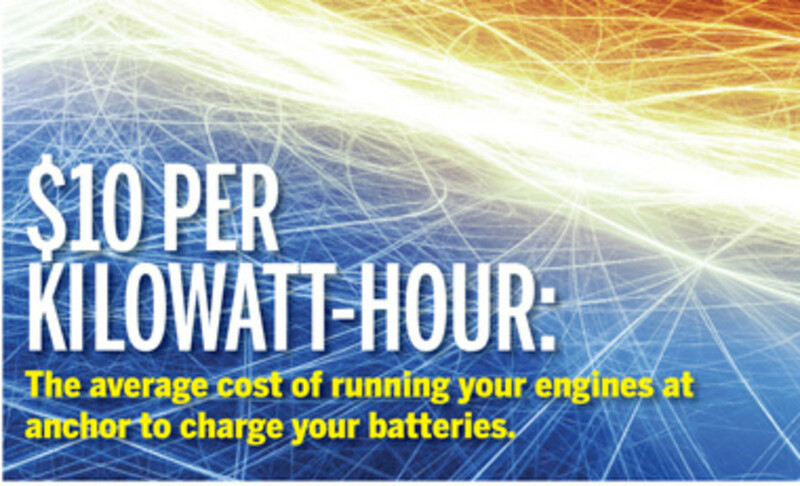 However, it’s not much use having 5, 10, or 15 kilowatts of alternator output if you can’t use the energy. We need batteries with very high charge-acceptance rates to high states of charge that can act as an energy storage “buffer.” Battery chemistry plays an important role here in as much as traditional wet-cell lead-acid batteries have a low charge-acceptance rate which rapidly becomes even lower as a battery approaches a full state of charge, whereas any form of lithium-ion has an extraordinarily high charge-acceptance rate to very high states of charge: a many-times-larger bank of wet-cell batteries is required to match the performance of lithium-ion. Although lithium-ion is currently the ultimate technology, it is extremely expensive and requires sophisticated management to keep it safe. 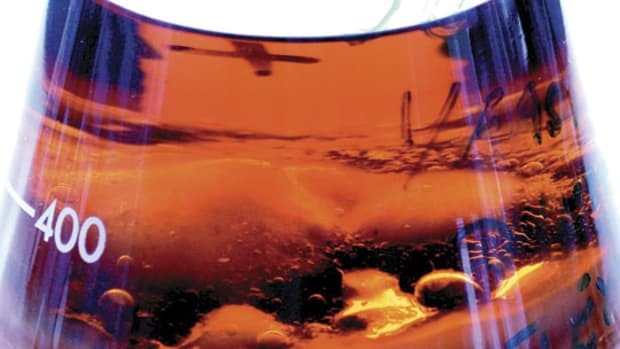 In recent years there have been numerous advances in the lead-acid world, notably with variants of absorbed glass mat (AGM) batteries, which have steadily ramped up performance, especially in terms of charge-acceptance rates and deep-cycling capabilities. Noteworthy are thin-plate pure-lead (TPPL) batteries and, more recently, batteries with carbon-doped negative plates (e.g. Northstar ‘blue’ batteries) and carbon-foam negative plates (e.g. Firefly). The latter promises to be a breakthrough technology. 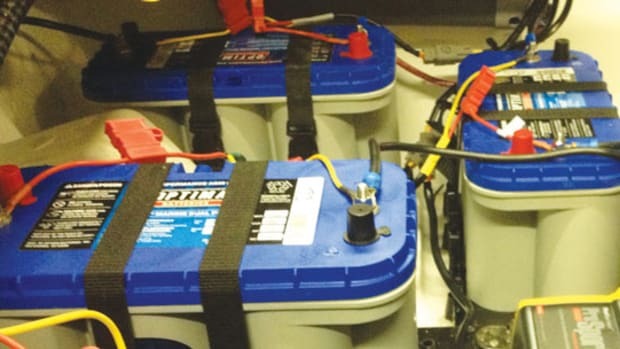 Batteries as a buffer play a critical role in raising average generator loads. 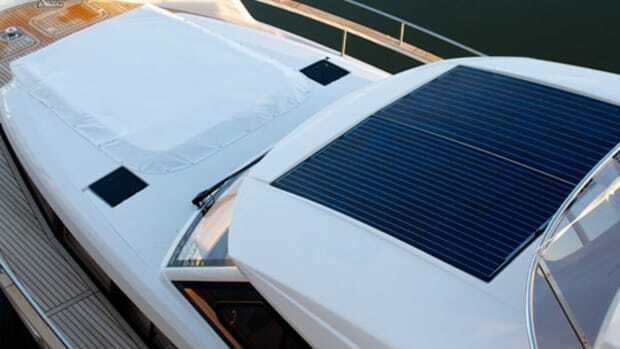 The basic concept is to put as many DC-to-AC inverters on the boat as are necessary to run the boat’s AC systems, together with a battery bank large enough to run the inverters, and to then only run the generator if the combined AC loads and battery charge-acceptance rate keep the generator pegged at its ideal operating point (sweet spot). Any time the load falls off, the generator is shut down and the AC system is run off the inverters. Once the batteries are discharged to the point that the combined AC load and battery-charging load will optimally load the generator, the generator is restarted. The process can be fully automated and seamless. Although there is no problem “stacking” multiple inverters to get just about any desired AC capacity, in practice for high AC loads the battery requirements make this unrealistic: Some modification of the scenario described is frequently called for. 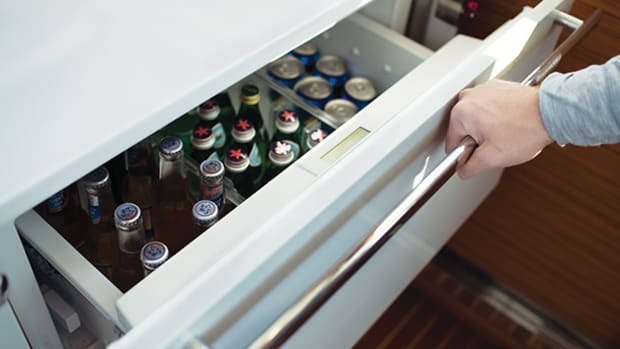 At the most basic level, major AC appliances can be given a “soft start,” eliminating the high inrush loads of older appliances and as such taking the peaks off the AC system. This also substantially reduces the maximum rated power required in a generator, enabling the generator to be downsized, which, with no other changes to the system, has the effect of increasing the average load. The next step is to engage in some form of load management, either manual or automatic, such that high loads are not brought online simultaneously, and/or the major AC consumers are concentrated in designated generator runtime slots. In the former case, this too reduces the peak load on the AC system; in the latter case, it reduces the load on the inverter and batteries during nongenerator periods. A step up in technical complexity but also effectiveness comes with synchronizing inverters. These have the ability to track the output from a generator. The system is programmed with a load limit for the generator (ideally, around 70 percent of its rated output). If the load goes above this (maybe the inrush current from an old-fashioned air conditioner) the inverter draws power from the batteries and kicks in to boost the generator’s output. If the generator load goes below the preset limit, the inverter switches to battery-charging mode and adds whatever load is necessary to put the generator back at its set point, up until the batteries can no longer accept this rate of charge. 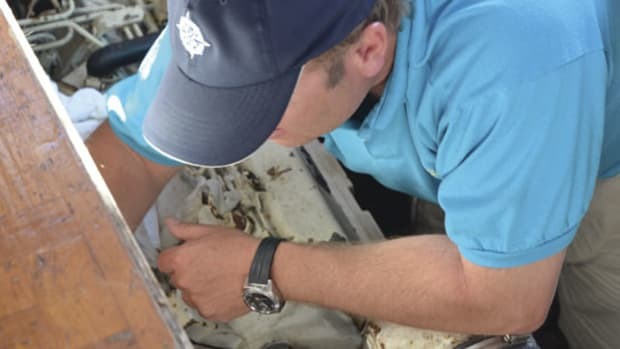 This is powerful technology that is now well tested but considerably underutilized in the marine world. On larger boats there is always a relatively high “background” AC load. In such a situation it makes no sense to transfer this to inverters and batteries. A better approach is to have a relatively small generator, running 24/7, which is optimized to handle this load, with an additional generator, inverters, and so on set up as described above to automatically kick in and handle the load whenever it goes above the base level. Both generators will now operate at, or close to, peak efficiency at all the times. There are other iterations of this theme, including variable speed generators and DC generators. In the latter case, the entire AC system is powered by inverters with the DC generator firing up whenever the inverter demand plus the battery charge-acceptance rate loads the generator to its sweet spot. The generator shuts down whenever the load drops below this level. 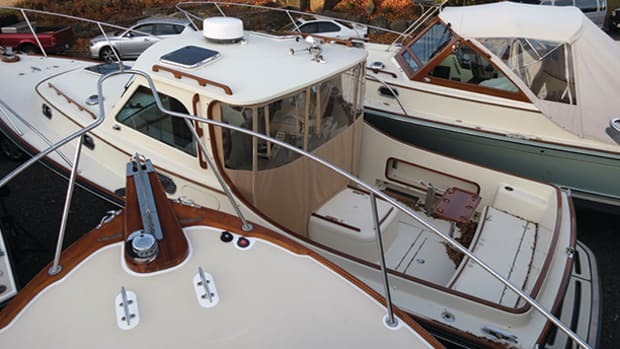 Regardless of the approach, the goal is always the same: to only run an engine when it can be loaded at, or close to, its peak efficiency, and to find other mechanisms to power the boat’s electrical systems when this cannot be done. Properly engineered, the net result will typically be a considerable improvement in efficiency with an often substantial reduction in engine run-hours. What’s not to like about that? 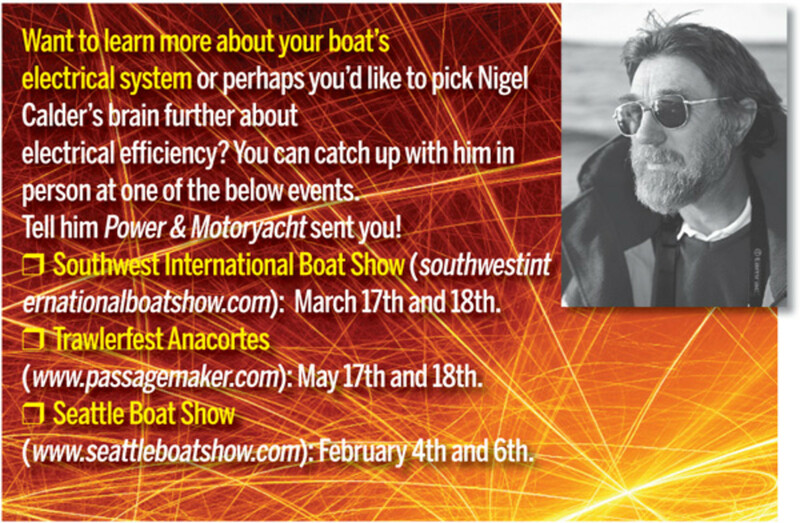 Nigel Calder has literally written the book(s) on boat systems, including Boatowner’s Mechanical and Electrical Manual, Marine Diesel Engines, Refrigeration for Pleasureboats, The Cruising Guide to the Northwest Caribbean, and Cuba: A Cruising Guide.